For complete information, please view the Official NYC Guide. 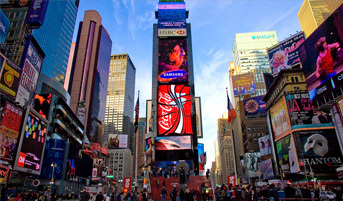 Not sure where to look while walking through world-famous Times Square? Don't worry—you're not alone. 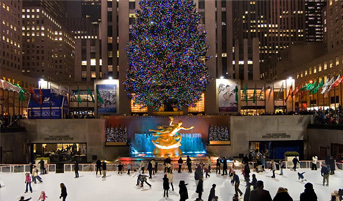 With massive digital billboards whose bright lights make midnight look like midafternoon; star-studded Broadway and Off-Broadway shows people peddling art and jewelry on the street; and, of course, the Naked Cowboy—who plays guitar in his tighty-whities—the expansive stretch of Midtown is a feast for all five senses. Visitors can shop in flagship locations of such stores as Toys "R" Us (which boasts an indoor Ferris wheel), take pictures with wax celebrities at Madame Tussauds, watch the ball drop on New Year's Eve or grab a pre- or post-theater meal along Restaurant Row (West 46th Street, between Eighth and Ninth Avenues), where many eateries offer prix-fixe deals. And with Broadway closed to cars from West 42nd to West 47th Streets, Times Square is now more pedestrian friendly than ever. With its countless stores, boutiques, pop-up shops, vintage havens and designer showrooms, New York City lives up to its reputation as a shopping capital. With so many possibilities, there's just one problem—where to begin? The best bet is to start big, with the iconic department stores, where you can experience a grand bazaar's worth of offerings in one location. You can ogle high-priced designer wares, pick up more affordable gifts for loved ones (or yourself) and enjoy beautifully crafted and, at times, over-the-top window displays. These 11 stores—found all over Manhattan, from the Upper East Side to Midtown to SoHo, though many have outer borough outposts, too—are essential visits on anyone's New York City shopping itinerary. 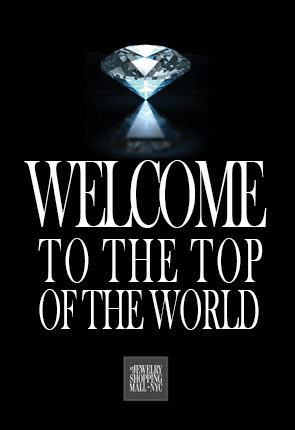 Located on West 47th Street, between Fifth and Sixth Avenues in Manhattan, the world’s largest shopping district for diamonds of all shapes and sizes as well as fine jewelry. 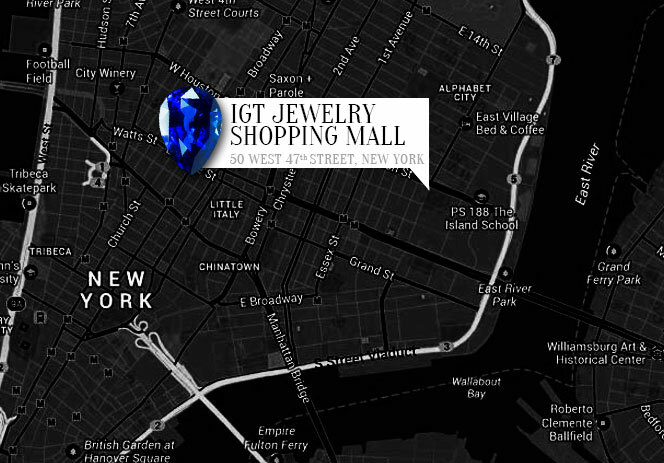 The 16,000 square-foot IGT Jewelry Shopping Mall, located on the first three floors of the Extell Development Co.'s new tower, includes 80 linear feet fronting West 47th Street between Fifth and Sixth Avenues. That city block, known as the Diamond District because it houses 25 exchanges with hundreds of independently operated open booths, will be given Madison Avenue glamour as Gulaylar gathers the best jewelers in New York and the world into an ultra-modern setting with state-of-the-art security. 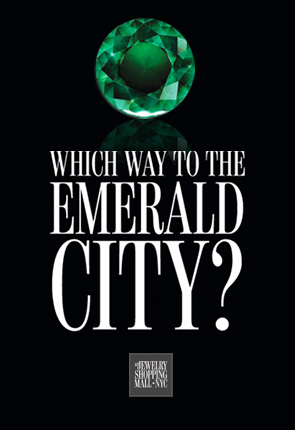 More than 90 percent of diamonds that enter the U.S., the world’s largest consumer market for the gems, go through the district. 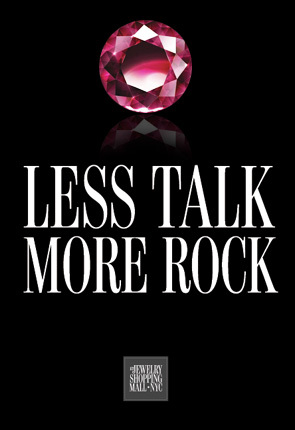 More than 2,600 independent jewelry-related businesses. For complete information, please view the LonelyPlanet.com. 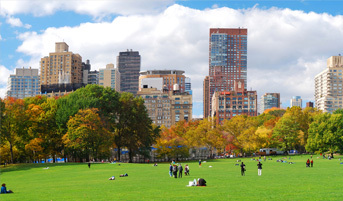 Like the city’s subway system, the vast and majestic Central Park, an 843-acre rectangle of open space in the middle of Manhattan, is a great class leveler – which is exactly what it was envisioned to be. Created in the 1860s and '70s by Frederick Law Olmsted and Calvert Vaux on the marshy northern fringe of the city, the immense park was designed as a leisure space for all New Yorkers, regardless of color, class or creed. And it’s an oasis from the insanity: the lush lawns, cool forests, flowering gardens, glassy bodies of water and meandering, wooded paths providing the dose of serene nature that New Yorkers crave. Today, this 'people's park' is still one of the city's most popular attractions, beckoning throngs of New Yorkers with free outdoor concerts at the Great Lawn, precious animals at the Central Park Wildlife Center and top-notch drama at the annual Shakespeare in the Park productions, held each summer at the open-air Delacorte Theater. 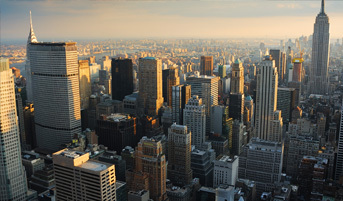 For complete information, please view the Official NYC Guide..
New York City's skyline is truly awe-inspiring. The skyscrapers, bridges, waterways, islands and monuments create a breathtaking panorama that is instantly recognizable worldwide. While you can feel the immensity of these surroundings from anywhere in the City, the grandeur of the cityscape is best viewed from above. Take an elevator ride up 1,050 feet to the 86th-floor observation deck of the Empire State Building; New York City's second-tallest structure (after One World Trade Center), this soaring art deco masterpiece offers a completely unobstructed, 360-degree view of the city below. For a spectacular vista that includes the Empire State Building itself, head up to the Top of the Rock, located on the 67th, 69th and 70th floors of 30 Rockefeller Plaza (home of NBC Studios). Both the Empire State Building and Top of the Rock are open late, so don't miss the chance to see the City lights shimmer after dark. John Roebling's engineering masterpiece was the world's longest suspension bridge upon its completion in 1883. One of the most recognizable structures in NYC, the bridge has been featured in countless movies and television shows and, as the first land passage between Manhattan and Brooklyn, represents a critical piece of New York City history. Though the bridge is visible from the shores of both boroughs, it is best experienced through a leisurely stroll across its elevated pedestrian walkway. Here, visitors from around the world can share a path with New Yorkers making their daily commute; those walking across can enjoy views of downtown Manhattan and New York Harbor on every step of the 5,989-foot traverse. The Manhattan-side entrance is at Park Row and Centre Street, across from City Hall Park. 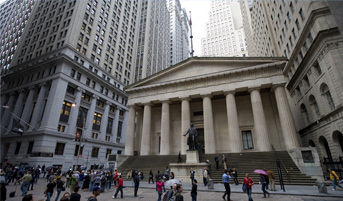 Lower Manhattan is the seat of the City's government, the home of Wall Street and a place where much of America's early history unfolded. The area is packed with cultural institutions, including The Skyscraper Museum and the Museum of Jewish Heritage. Battery Park features 25 acres of open space—including gardens and the Castle Clinton National Monument, a fort built in preparation for the War of 1812. Stone Street, an appropriately named cobblestone thoroughfare, features a wide range of worthwhile drinking and dining establishments including Harry’s Cafe and Steak, Vintry Wine & Whiskey and many more. Nearby, City Hall—one of America’s oldest functioning seats of municipal government—offers public tours. 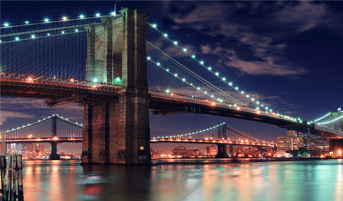 After visiting the premises, consider walking across the iconic Brooklyn Bridge, located just across the street.